Every year the London Marathon serves as inspiration to get us off the couch and into our running shoes. Yet once the initial enthusiasm wears off, poor technique can prevent us finding our flow and discovering the feeling of free and easy movement. Just as importantly, treating running as a task – another item to be ticked off a daily to-do list – is a likely route to boredom and bad habits, even for the most ardent of runners. The Alexander Technique offers a response to these issues. The Technique is a way of developing good use of the body and greater awareness of the way it functions. By applying its principles to sport and physical activity, we can approach running as an art rather than purely a technique. The emphasis becomes less on targets such as running a set distance in a pre-determined time, and more on the process of exploration and enhanced awareness that running offers. This is especially important when training for a marathon where an optimum and safe running technique can often become overshadowed by time and distance goals. Think about ‘running tall’ so you lift your torso up out of your hips and sense your body ‘lengthening’. This will prevent you lapsing into a slouch and ‘running heavy’, when you pull your body downwards and passers-by 100m away can hear your feet slapping on the pavement. Your head weighs around 4.5kg, so don’t drag yourself down by staring at the ground. Cast your gaze forward, so your head is nicely balanced on your neck and spine. The scenery’s better, too! By keeping your body upright, you will be able to land with your feet directly underneath your body rather than shooting out in front of you. This reduces the braking forces caused by ‘heel striking’ and also promotes a more efficient stride pattern. Try to ensure that your weight when you land is towards the front of each foot rather than towards the heel. This will help you to run lightly. Use your arms. It’s amazing how many runners plod along with their arms held stiffly at their sides. Running like this is like driving with the handbrake on. Instead, keep your elbows bent at 90 degrees, your wrists and hands neither floppy nor rigid, and move your arms backwards and forwards slightly across your body. When you use your arms in this co-ordinated and rhythmic fashion, they are a wonderful source of power. Run with control. Take time to practise running very slowly. 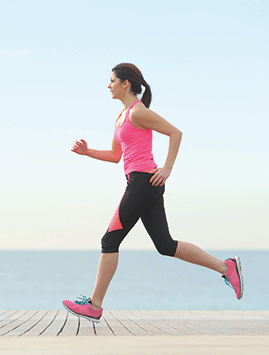 Aim for 12 minutes per mile, at around 180 strides per minute. You will now notice whether your footfall is light or heavy, whether your head feels poised on your neck and spine, and whether you can sense unnecessary tension in your arms, shoulders and back. Training at other speeds will also help you decide which pace enables you to run most efficiently and, if you are planning to enter a race, tame any tendency to set off too slowly or too fast. First, to become aware of any tension in your body while running. Second, to allow yourself a moment’s pause to make a conscious decision to release the tension – what Alexander called ‘inhibition’. Third, to give yourself direction to expand your ‘primary control’ – the dynamic organisation of your head, neck and spine. The result will be a run that feels light, graceful and free of stress. Take a break from routine. Following a routine is not in itself a bad idea. The problem is how to prevent the familiar from becoming mechanical, where predictability dulls the brain and you are no longer so aware of what you’re doing. Instead of blindly trudging round your usual route at your usual pace ‘because it’s Thursday evening and I always run on Thursday evening’, consider how you might react to not running on Thursday evening one week and setting out on Saturday lunchtime instead. You will almost certainly find the experience invigorating and inspiring. Rather than switching off due to over-familiarity, the change of environment will help you switch on. Not only will you be more aware of your surroundings as you view them afresh, you’ll pay greater attention to the signals coming from your muscles and joints as you run. Forget about targets. While it’s useful to have objective ways of measuring progress, remember that the outcome of any activity is just an indicator of how you’re getting on. Relying on it as the only indicator can lead to a false sense of accomplishment or, more problematically, a feeling of failure if you don’t hit your targets. Albert Einstein wasn’t known as a runner but one of his quotes captures this dilemma exactly: “Not everything that counts can be counted and not everything that can be counted counts”. It’s too easy to move from being a ‘fun’ runner where you enjoy the activity for its own sake to someone for whom times and distances are your raison d’etre. Lastly, consider running as an art. It’s very easy to approach a run half-heartedly. Reluctant, for whatever reason, to push yourself physically and emotionally, it’s sometimes appealing just to go through the motions. Once you start doing this, though, staying within the confines of your previous experience risks becoming your default mode – at which point boredom and demotivation can quickly set in. Instead, consider running as an art with skills to be practised. It doesn’t matter what you did yesterday – it’s always the next step that counts. By making a conscious decision to treat each run as a new opportunity for learning and self-discovery, you’ll enhance both the experience and yourself.